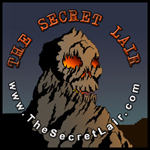 Meanwhile, at The Secret Lair… | Kris Johnson's Blog…sort of. When I’m not blogging here (which seems to be an awful lot, of late), one of the things I’m doing is blogging over at The Secret Lair. If you’re missing my particular perspective on geeky movies and such, you may want have a peek. Recently, I talked about the rebooting of the Spider-Man movie franchise, the trailer for The A-Team movie and (of all things) Friday the 13th . You should also check out Chris Miller’s rant on the apparent lack of a remake of The Rockford Files , if only because it ties in to The A-Team discussion. And I’d be remiss if I didn’t direct you to the latest installment of our webcomic, featuring our version of a yuletide classic carol. Later this week, we’ll have a review of the Star Trek Online beta from one of our intrepid field reporters and possibly a review of the zombie/Star Wars hybrid novel Star Wars: Death Troopers by Joe Schreiber (provided I actually finish the book on time). I have no idea what Miller has cooked up for tomorrow morning, but I’m sure it will be curmudgeonly. EDIT: Links removed, as The Secret Lair is no longer a going concern.